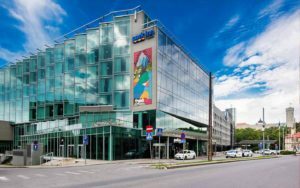 The conference official travel agency Reisiekspert has arranged special prices for participants in Park Inn by Radisson Meriton Conference & Spa Hotel Tallinn. These prices are offered through online reservation ONLY. Please use conference registration form for booking. 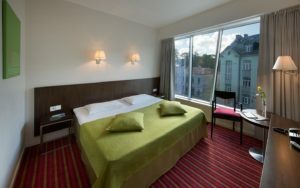 Located in the heart of the capital, this modern Tallinn hotel offers easy access to Old Town and the Parliament of Estonia. Guests stay only a short distance from many city center attractions, including shopping, theaters and restaurants. Stylish and contemporary, the hotel welcomes guests with 465 tastefully decorated rooms that include tea and coffee provisions and air conditioning. Dine on site at a restaurant serving grilled specialties and relax at the pastry shop or 2 bars. Guests also enjoy Free Wireless High-speed Internet, convenient outdoor and garage parking, extensive spa and sauna areas, and a Sports Club with personal trainers available. This hotel features expansive meeting facilities, including 14 versatile conference rooms. All conference rooms provide Free Wireless High-speed Internet and modern audiovisual equipment to ensure comfortable and productive meetings.